A few years ago, I read the book Essentialism, which I loved for many reasons. But perhaps mostly so because it introduced me to the idea of the “quarterly personal offsite.” I know, the name sounds ultra-corporate, but the practice itself is actually really simple — taking time once every three months to pause, reflect on a list of questions about how life’s going lately, and think intentionally about what’s ahead. Granted, over the years I have tweaked it a bit to fit my vibe. Starting with the fact that I nixed the corporate-ese and prefer to refer to this practice my own little “seasonal mini-retreat,” which sounds far more enjoyable. 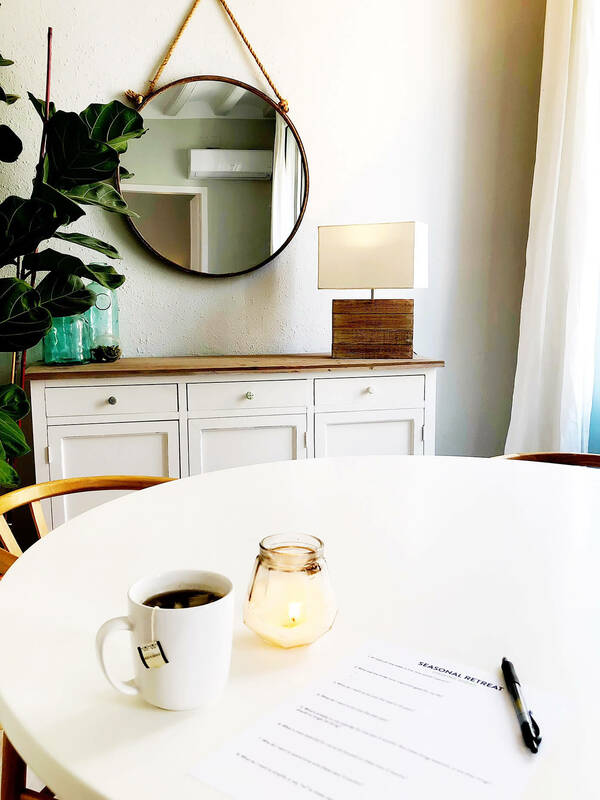 And while it’s awesome to get away for an entire day, as the author recommends, most of the time my mini-retreat is realistically just an hour or two tucked away in a coffee shop, or soaking up sunshine at the park, or cozied up at home with a candle. Because — let’s be real — I’ve found that comfort and convenience are the two keys to making this practice actually happen for me. 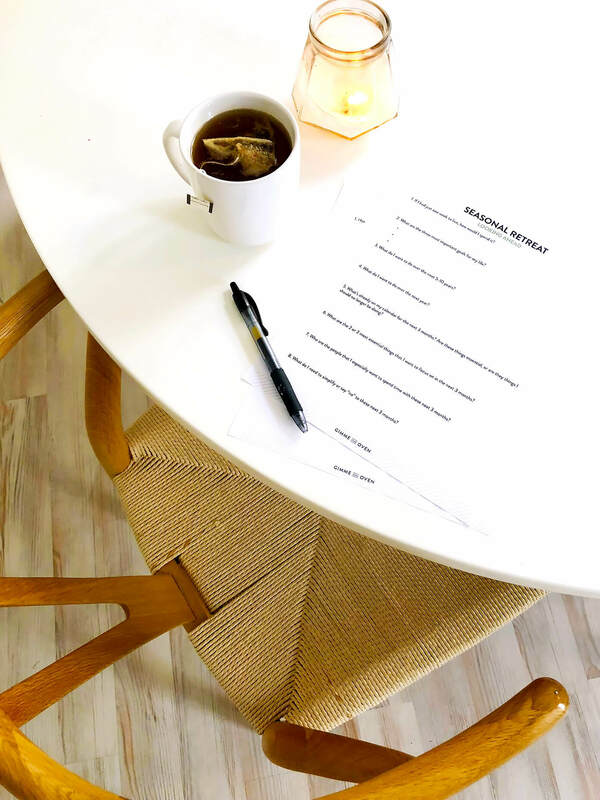 I have also adapted the long list of Essentialism reflection questions down to two short, simple, printable pages of questions that work for me. They’re nothing fancy — just 12 simple questions that help you move from big-picture values and dreaming down to next-three-months details and planning. And I’m telling you — it’s amazing how helpful, clarifying, grounding, restoring, energizing, and motivating a few short hours journaling through them can be. I’m also convinced that the every-three-months-ness of this ritual is key. The past three months always feel fresh enough to reflect upon clearly, both intellectually and emotionally. And when looking ahead, the next months also seem like the perfect amount of time to set some realistic goals and plans, without having the pressure of sticking with something for the next twelve full months ahead (like, ahem, famously unreliable new year’s resolutions). Plus, hey, a quick solo coffee date every three months is something I can totally fit into the calendar! Anyway, I shared on Instagram yesterday about my seasonal mini-retreat this fall, which was nothing glamorous by the way — just me, home alone for the morning still in my pjs, mug of hot cinnamon spice tea nearby, candle burning, thinking about coming up on the end of our first year in Spain and the beginning of our next. And tons of you responded that you loved the idea of a quarterly ritual like this, and would love a copy of the questionnaire. So I thought I’d pop in briefly this morning to share it with you! As I said, I’m a big fan of the quarterly schedule that Greg McKeown recommends in Essentialism. 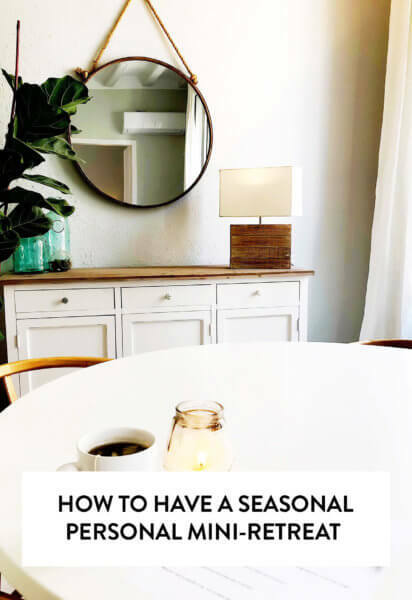 I’m a big “seasons” person in general, so I love the idea of intentionally pausing once each winter, spring, summer and fall. But the specific month of the season, day of the week, and time of day are completely up to you. And I highly recommend scheduling them in advance on your calendar so that you don’t space them off! And finally, here are the questions I use! They’re nothing fancy — just twelve simple prompts to help reflect on the past three months and begin thinking about what’s ahead. I really recommend taking about 5-10 minutes to journal each one. Because chances are, even if one initial answer comes to mind quickly, some additional new insights may emerge as you continue to write. 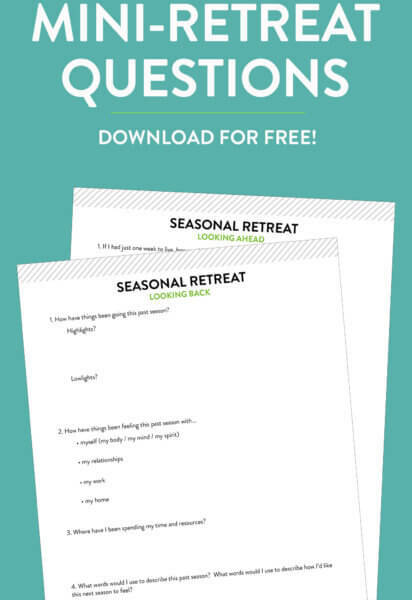 Anyway, if you decide to have your own seasonal mini-retreat, I’d love to hear how it goes! Feel free to drop me a line here or on Instagram. And of course, feel free to forward on this link and PDF to any of your own family or friends. I hope that they will be helpful. This list of questions originated from a Google doc that was circulated amongst my friends from Kansas City years ago when we read and discussed this book together. Some questions were probably originally from Greg McKeown (author of Essentialism), some were edited by friends, some I edited and tweaked over the years myself. At this point, I honestly can’t remember who wrote any of them. But thank you, mystery friends! This post also contains Amazon affiliate links. Me encaaaanta esta idea, Ali. 💜 I am going to try this weekend! I love this! I actually use the Powersheets by Lara Casey (www.cultivatewhatmatters.com) to do this and then use her tending lists for monthly, weekly, and daily goals. I actually don’t use the daily that much as those are more habits that I want to create or keep up on, but the quarterly check ins that go along with each season of the year are so awesome. They ask meaningful, deep, thought provoking questions about how you want to live your life over the next 3 months. It has been a game changer for sure! Oh my goodness! This sounds so cool! I’m going to do this! Thank you so much for sharing! Looking through the questions, I think they are mostly for younger people (for example, as a retired person, I don’t have a life that needs simplifying). That said, I think that doing some internal soul searching on a somewhat regular basis is a very good idea for all of us. I think I am very fortunate in how my life is going now, but wish I’d had something like this when I was younger and life was difficult. Yes!! I’ve been working this year on refining various routines (morning, evening, etc)…and I really love this idea! Thank you so much for sharing, Ali! This is wonderful Ali, thank you so much for sharing! I’ve been sharing your recipes and how much I love them, and now I’m going to share this. I’ve been discussing being “in the moment” with my therapist (counselor on our Employee Assistance Program) and I know she’ll love this as well and it’s something I can use to discuss my life with her. Thank you!! This seems to be a really good idea! A regular pause in my life to make some assesmants. Thanks for sharing! Thank you for your post, it’s very inspiring, I will try it as soon as I can! I’m headed out the door to my favorite coffee shop right now for my first mini-retreat. Thanks for the inspiration! I already know I’m going to love this! Every year my husband and I do a retreat at New Years. We spend time reflecting and setting our own goals (in 5 key areas: personal (which includes health and fun/recreation); family; business/career; financial;and spiritual). Then we spend time talking about those goals and aligning on the ones that are relevant to us as a family. We also use the time to read inspiring material. This has been incredibly useful for us over the years, and has given us space to navigate big issues and pave the way for our dreams in ways that allow us to still achieve those dreams despite the curveballs that life inevitably throws our way. 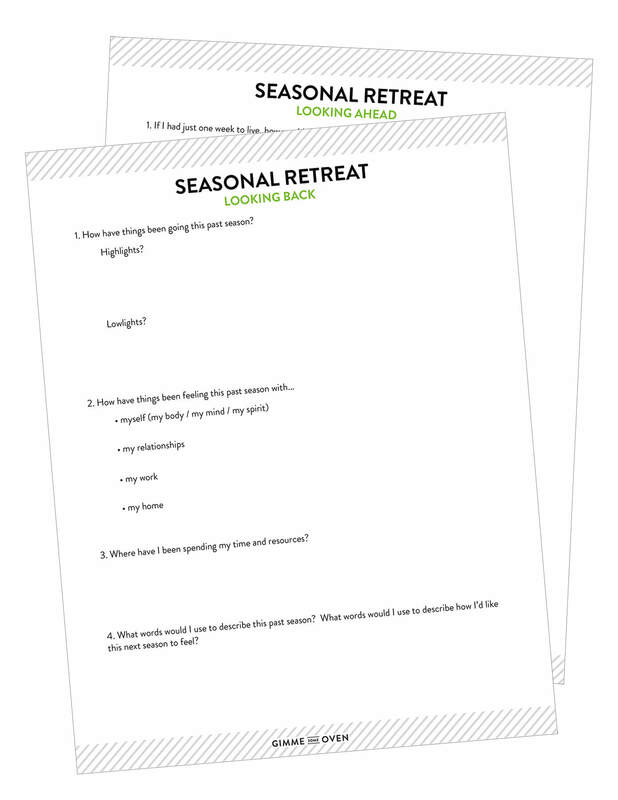 Your list of reflection questions is wonderful and we’ll incorporate it this upcoming year. We also review our goals at the end of each quarter (we have a simple spreadsheet we use to track them) and refresh them with the action items needed for the current quarter. Thank you for this great blog post! I found out about it thanks to Roger Whitney, The Retirement Answer Man’s “6 Shot Saturday” weekly email. Thank You. I love this too ~ WILL DO. But, in general, ALL your entries make my life more interesting and encouraged. Your recipes are THE BEST. Finding your blog reinvigorated my love of cooking. At 68 with still LOTS of kitchen/ home time enjoyed, I just REALY appreciate you. 8) Thanks. I’m so excited to do this! Thanks for sharing! !